A simple and delicious one-pan meal. 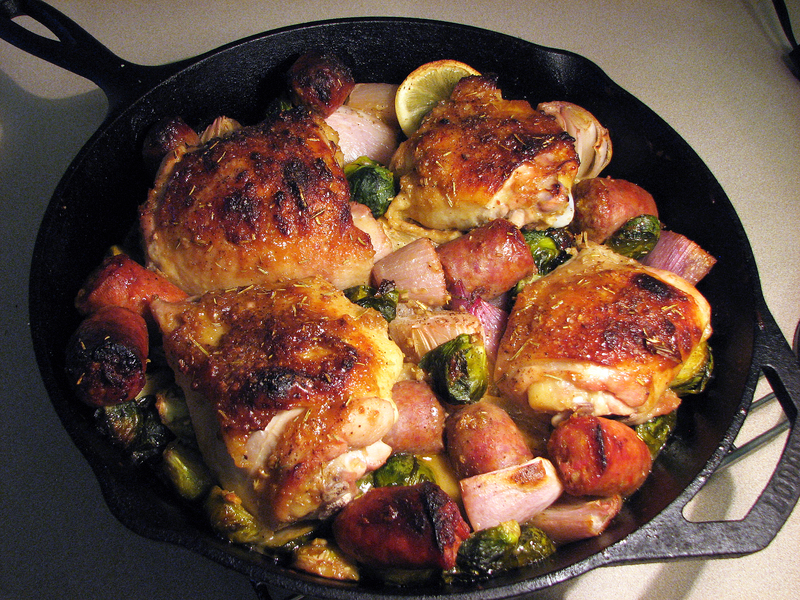 Combine Brussels sprouts, shallots, and lemon with 2 tablespoons (30ml) oil in a 12-inch cast iron skillet. (Alternatively, you can use a rimmed baking sheet.) Season to taste with salt and pepper and toss to coat. In a small bowl, combine garlic, mustard, honey, Worcestershire sauce, rosemary, and remaining 1 tablespoon (15ml) oil. Season with salt and pepper and stir to form a paste. Rub paste all over chicken. Nestle chicken and sausage pieces on top of Brussels sprouts. Roast on lower rack until Brussels sprouts are browned and tender and an instant-read thermometer inserted into coolest part of the chicken registers at least 165°F (75°C), 25 to 30 minutes. (If chicken and sausage are done before sprouts have browned enough, you can transfer the meat to a plate and let the vegetables finish in the oven; recombine before serving.) Serve.